Hard work, dependability and a commitment to on-the-job safety has paid off for Recil Hensley. The Roscoe resident was named Driver of the Month for December by the Wisconsin Motor Carriers Association and is now up for the group’s driver of the year honors. 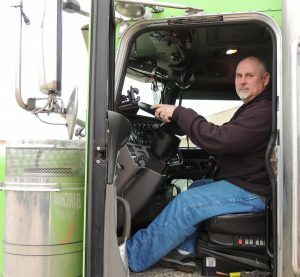 Hensley, an owner-operator driver for Birchwood Transport, Inc., Kenosha, Wis., was nominated for the honor by Scott Mulqueen, director of human resources and safety at Birchwood. Hensley, a truck driver for over 25 years, learned of the recognition in early December after Mulqueen had approached him with the idea several weeks before. The glowing nomination letter sent to the Wisconsin Motor Carriers Association by Mulqueen not only commends Hensley on his dependability but also his safe driving record. “Recil is one of what I call our ‘NO TOUCH’ owner operators … The drivers that I put into that category are those to whom we can assign a task and never have to think about it again. He is a driver who takes his duty to the general public and other trucks seriously. His work ethic can only be matched by his great personality and helpful demeanor…” Mulqueen wrote. Hensley was up against several other nominees from across the state of Wisconsin for the December honor. In March he and his wife, Mary Beth, will travel to the Wisconsin Dells for an awards banquet where Hensley will compete against the 11 other 2018 nominees for Trucker of the Year. As an owner-operator driver, Hensley owns the truck cab portion of his semi and currently hauls trailers of turkey by-products for Birchwood Transport. His 2016 Peterbilt long nose neon green truck is hard to miss as he travels his route through Wisconsin, Iowa, Indiana and Illinois. 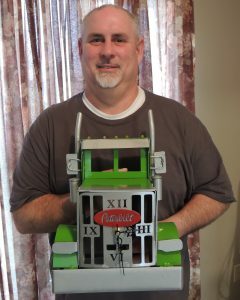 “My truck’s nickname is Optimus Lime, which was thought up by my son Recil and his friend Devin. We were talking one morning at the bus stop while my truck was still on order and Devin told Recil that I should name the truck Optimus Lime. I ran it by some of my trucking buddies and we all thought that is sounded cool, so the name stuck,” Hensley said. The truck’s name is prominently displayed on the back of the cab. Hensley has a designated route that he follows six days a week with Sundays off. The cab of his truck is a sleeper, so he can stay overnight in the cab once he is parked at a truck stop. Hensley said that even though his schedule takes him away from home during the week, it’s better than other trucking schedules that take truckers away from their families for a month at a time. What put Hensley into the running for Trucker of the Month and possibly Trucker of the Year is his core value as a trucker: safety. Having a safe drive also depends on doing a thorough pre-drive check of the truck and its components. As per Department of Transportation regulations, Hensley walks around his truck prior to departure and checks the tires, lug nuts, mirrors, the hood, the engine, oil levels, overall fluid levels and the brakes. Once Hensley is on the road, his commitment to safety requires a constant vigilance of his surroundings and fellow drivers. Hensley’s Driver of the Month award is certainly a well-deserved honor for his hard work, dedication to safety and personal sacrifices while working in the ever-demanding transportation industry. “This honor really hasn’t sunk in yet. I’ve never had an award like this ever in my career, so it’s kind of nice to see the hard work…pay off,” he said.